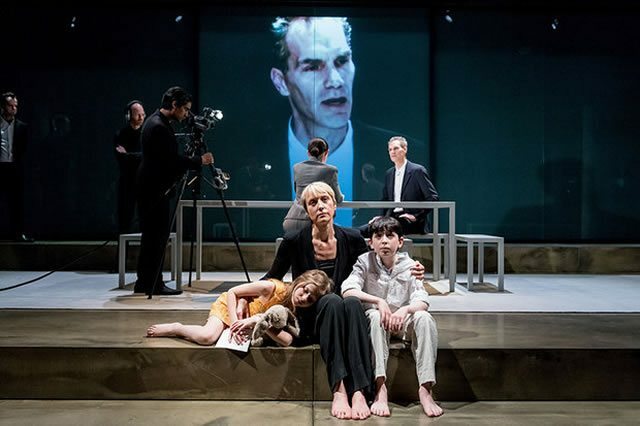 Oresteia, Trafalgar Studios, London. 5 Star review. An elemental piece of theatre, depicting the violence that lies dormant in us all. 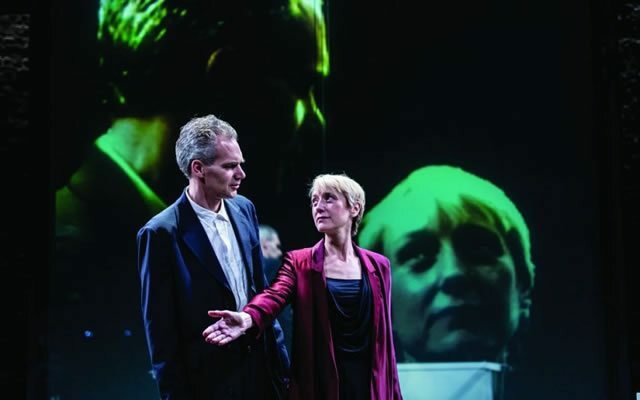 Strange things happen after you see Robert Icke’s prodigal production of Oresteia at the Trafalgar Studios. Your day will be interrupted by flashes of choral music, the image of a girl perched on her father’s knee, the sound of a running bath. You’d think that after 3hrs 40 mins of a millennia-old Greek play, an audience would be pleased to leave it behind - but that Oresteia continues to haunt beyond the confines of the studio cements it as a truly remarkable piece of theatre. There’s really no non-pretentious way of saying that it’s the best piece of art I’ve ever seen. Credit in the first instance goes to Icke, whose seamless adaptation of Aeschylus’ original text is the furious beating-heart of this production. In turns poetic and devastatingly blunt, it pumps new blood through the veins of this epic exploration of one family’s cycle of revenge; the sacrifice of a daughter by the father, the murder of the father by the mother, the murder of the mother by her son. Icke’s innovations are so successful that they appear to be just subtle touches. He frames the action as a series of Orestes’ memories during the trial for his mother’s murder, and ‘updates’ the king Agamemnon to resemble a President or Prime Minister to give the play a sense of immediacy. Even further, by extending the story of Iphigenia’s sacrifice into a stunning play in its own right, the revenge cycle is set in motion and is completely understandable even if you’ve never read a word of Aeschylus in your life. And I’m assuming most of us haven’t. With this in mind, Icke’s greatest success is in dusting-off the legend and making it seem overwhelmingly accessible and real. But as is probably becoming obvious, being ‘real’ doesn’t mean lacking in poetry as some critics have suggested. With a text so agonising, the moments of poetry are manifested in images and sounds. We watch in silence as Angus Wright’s Agamemnon cradles the tiny bird-like Iphigenia, as if afraid to crush her, as he feeds her the drugs that will kill her; Lia Williams’ Klytemnestra dressed in black splayed across the frosted glass of Hildegard Bechtler’s minimal white set; the sound of her primal scream when she learns of Iphigenia’s sacrifice and again when she is finally free from Agamemnon. These images are branded into the audiences’ memory and emphasise the pressures we experience when faced with the question of what is moral and what is just. In his memories, Orestes returns to moments with paranoiac frequency: at the family dinner table, the choral music, the running of a bath, and the opening of a wine bottle. Each time, an action is imbued with a different meaning and we’re given a glimpse into the cracks below the surface of the ordinary. Icke’s demands on his actors are colossal - and with brilliant consequences. Williams and Wright deliver mind-blowingly complex characters and are supported by a strong company. The almost primal physical awareness of the cast, and Williams in particular, gives the impression of a family held together by the very sinews they tear and blood they let spill. The dedication to their craft and to this production in particular is shown during the intervals: when audience members are getting out their iPhones, having a chat, drinking some wine, the actors remain on stage. In suspended animation, in the zone. Oresteia is an elemental piece of theatre that inspires despair and utter terror at the violence that lies dormant in us all. As Klytemnestra stands triumphantly alive over the bleeding body of her husband, she looks up at the audience; ‘You all have knives in your kitchen’.